August might yield a barbecue summer evening in England, but it has yielded an exciting award from the World Economic Forum for Tokamak Energy, so they will barbecue in any weather. Others in the area of Small or Alternative approaches to Fusion are making steady progress as seen in our Twitter stream. 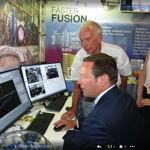 Ed Vaizey tries out the TS-2 control system at Royal Society. 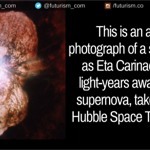 A supernova rebounds after 25 years. Supernova repeat performance after 25 years. Los Alamos study of wall damage by Helium in ITER. 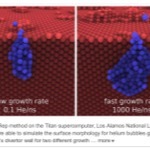 Los Alamos computes helium bubble growth in ITER steel walls. Making fun of the trouble we're in! 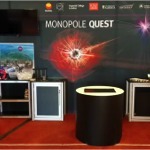 development of cost-effective, clean energy from fusion, has been named a 2015 World Economic Forum Technology Pioneer. Tokamak Energy aims to fast track the development of fusion energy by combining two emerging technologies – compact, spherical tokamaks and high-temperature superconductors. It is one of only 49 companies to receive the prestigious distinction from the World Economic Forum this year, which honours innovative organisations from around the world that are poised to have a significant impact on business and society. Tokamak Energy was chosen by a professional jury from hundreds of candidates as one of the 49 selected companies. Through this award it will have access to the most influential and sought-after business and political network in the world, and be invited to the World Economic Forum’s “Summer Davos” in Dalian, China, this September, or the Annual Meeting in Davos in January. The Technology Pioneers were selected from among hundreds of applicants by a selection committee of 68 academics, entrepreneurs, venture capitalists and corporate executives. Notable members of the committee include Arianna Huffington (founder, Huffington Post) and Henry Blodget (editor-in- chief, Business Insider). The committee based its decisions on criteria including innovation, potential impact, working prototype, viability and leadership. Tokamak Energy joins notable past winners including Google (2001), Wikimedia (2007), Mozilla (2007), Kickstarter (2011) and Dropbox (2011). More information on past winners can be found here. Tokamak Energy is a private company working to develop compact fusion power. The company was originally established to design and develop small Spherical Tokamaks and compact fusion reactors for a range of applications. Since then, the strategy has evolved to focus on building a pilot plant to exceed fusion energy breakeven. power in 1997. Tokamak Energy is particularly focused on Spherical Tokamaks, pioneered at Culham, because these compact devices can achieve a much higher plasma pressure for a given magnetic field than conventional tokamaks, i.e. 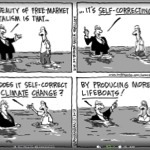 they are more efficient. Combining Spherical Tokamaks with High Temperature Superconductors, which can give higher magnetic field than conventional superconductors at more attainable temperatures, means we can achieve high fusion power from compact tokamaks. the world by engaging business, political, academic and other leaders of society to shape global, regional and industry agendas. 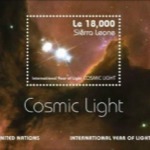 Incorporated as a foundation in 1971, and headquartered in Geneva, Switzerland, the World Economic Forum is impartial and not-for-profit; it is tied to no political, partisan or national interests (www.weforum.org). 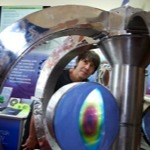 Brian Cox views Magnetic Coils for toroidal field in Small Tokamak. Aruntov will model plasma performance for new reactor designs. 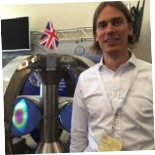 Dr. Otto Aruntov, Tokamak Energy's newest recruit. 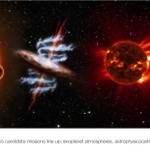 What if there are magnetic monopoles? Two Ups, 1 Down, and 1 Down with its anti-quark in a complementary 'Color' make a stable group. 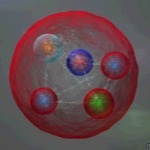 There are Pentaquarks as predictd by the Standard Model! 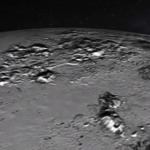 2 mile high ice mountains imply a hot radiative core for Pluto. Pluto has about 500 Trillion tonnes of Deuterium fuel. A Fusion fuelling station? 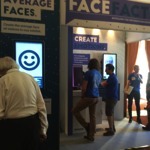 Will your robot see what you are thinking?